Would you like to gather up friends or family and head for the solitude and fun of the lake, but your group doesn't relish a week of camping. Well how about having a 2 or 3 bedroom houseboat to go to the spot of your choice with all the comforts of home. These 14' X 52' vessels have a full kitchen (that is a galley for you landlubbers), living room with TV and DVD/VCR, patio with grill on the front, a roof deck from where you can sun bathe and navigate the boat. They're equipped with heat and air conditioning. Don't worry about operating the boat. A short Captains lesson at check-in will teach you what you need to know and you can always call back to the marina on the marine radio. Grand Lakefront Resort Club USA offers two distinctly different locations for houseboat vacations. Eufaula Lake is the 15th largest lake in the United States and known as the "Gentle-Giant." It spans over 102,500 acres of water, plus numerous sandy beaches. Fabulous fishing is available on the lake year round and the most beautiful time of year is spring and fall because of the spectacular scenery of Southeast Oklahoma. The lake boasts such fish as striped bass, largemouth bass, white bass, crappie, catfish, walleye, and numerous sunfish. Each of our boats is equipped with a slide from the roof to provide hours of fun swimming in the lake. The St. Johns River was Florida's first tourist attraction. Although the steamboats that worked in its waters in the 1800s have disappeared, the beauty and magic of the river remain. There's no better way to immerse yourself in the beauty of the St. Johns River than on a houseboat. From marshes, springs, and tributaries, to the main channel of the river, the St. Johns provides a vast array of canoeing and kayaking opportunities. The St. Johns is also known for excellent fishing, especially largemouth bass and is home to numerous species of plants and animals. It is not uncommon to see Alligators and Manatees in the springtime when the water warms up. Located between Orlando and Daytona Royal Host Club/Holly Bluff Marina offers a unique Florida vacation experience. 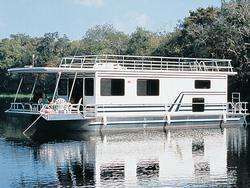 Get back to nature and cruise the St. John's River aboard a modern fully equipped and air conditioned houseboat. See live alligators basking in their natural habitat. Explore nearby warm water springs where the endangered Manatee spend winters in the crystal clear waters. Great Blue Heron, Egrets, Eagles and Ospreys are all common sights. Orlando and Disney World are only 60 miles away.